FRANKFORT, Ky. — More Kentucky-grown fruits, vegetables, and agricultural products will feed hungry Kentucky families this year, which in turn will help support the state’s farming communities. This season, 25 Kentucky farmers markets and two Fresh Stops Markets in Lexington are offering the successful “Double Dollars” program, which allows people receiving government nutritional assistance to double their spending power if they shop at local farmers markets. 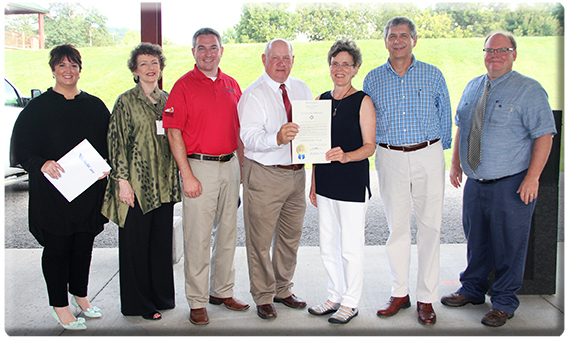 The expansion was announced this morning during a celebration and proclamation of Kentucky Farmers Market Week at the Franklin County Farmers Market. Those in attendance included Governor’s Office of Agricultural Policy executive director Warren Beeler, Kentucky Agriculture Commissioner Ryan Quarles, Community Farm Alliance executive director Martin Richards, and several other state and local officials. “Double Dollars” means that families receiving assistance from the Supplemental Nutrition Assistance Program (SNAP), Women, Infants and Children (WIC), or the Senior Farmers Market Nutrition Program (SFMNP) are able to double their spending power (up to $10 per day) by shopping at farmers markets. The state’s Agricultural Development Board, chaired by Governor Matt Bevin, recently authorized more than $78,000 to support the Community Farm Alliance, which administers the Double Dollars program and funds on-site managers for the state’s farmers markets. WellCare Health Plans of Kentucky donated $6,000 and the Cabinet for Health and Family Services contributed an additional $5,500 to support Double Dollars. The Double Dollars program began with just six markets in 2014. Richards said the program has been popular with both farmers markets and with the families using the program. Surveys of Double Dollars users showed that people using the program felt they were eating a lot more fruits and vegetables and felt more educated about healthy eating. Jackson County Farmers Market•	Knox County Farmers Market Inc.
For more information about Kentucky’s farmers markets, visit the Kentucky Department of Agriculture at kyagr.com/marketing/farmers-market.html. For more information about the Double Dollar Program visit the Community Farm Alliance at cfaky.org/what-we-do/fmsp/.